This post is about the power of visualization. I like to always include some type of visualization technique in my coaching because it really works, if you work it. The thing about visualization is that you must practice it for it to work. My son jayden, he is my youngest, he’s 14, we were talking one day about goals. I have this talk with my kids at least once a year because goals are important and I think having clarity helps put a framework around goals. It helps propel you forward. It’s necessary to have a blueprint to know where you want to go in life while allowing for flexibility. So, we were having this discussion and he shared that he wanted to dance like Chris brown. That surprised me because I didn’t know he liked dancing like that, let alone that he liked Chris Brown as a dancer. Chris is an outstanding dancer. At this point when he is explaining why he likes chris brown and his dancing I suggested that he visualize what he is doing in his life in regards to dancing like Chris brown. I asked him, are you performing as a dancer for Chris brown? Are you on stage in front of an audience dancing? Are you performing in competitions? Are you making music videos? What exactly do you see yourself doing as it relates to “dancing like Chris brown”. Since this was a goal of his, I wanted him to see a picture with very clear details around this goal. He confirmed that he could see himself dancing on stages, in front of large crowds, people cheering for him, he is helping choreograph dance moves, and that he has fiends with other hip hop dancers that also perform. The importance of visualization is that thoughts create actions. Many people think its just about pretending or imaging something that does not exist. If it didn’t exist then how did you think of it in the first place? This idea or thing you see already exists, it just hasn’t appeared or manifested in your current reality YET. Your efforts are needed for manifestation to happen. Everything that is in our reality started with a thought, then it was followed by an action. A chair was a thought first. Then that person took action by making plans on how this it would look, they brainstormed on a name for this thing to sit on, and then the next idea came and so on and s on until an object made of wood with 4 legs that was called a chair was presented to us. Today this is a mainstream every day essential piece of equipment that you do not think about. But it started as only a thought. Ok, back to my story. I told Jayden to save that picture he saw in his mind. To frame it like a snapshot and every day for only a couple of minutes, to pull that picture up and see it. He only needed to see this picture for a couple of minutes but he needed to see the details within this picture. A couple of months later Jayden came back to me and said he wanted to take hip hop classes. He was very clear on the type of hip hop classes he wanted to take. He stated he wanted the class to be taught by a guy that was all about hip hop, highly skilled, and he wanted the class to be all guys because he wasn’t conformable dancing around girls. I was like dude you gotta be kidding me. How was I going to find that?! But the thing that did not occur to me until later, is it already existed, this class he was describing already existed, Jayden could see it. I was just a resource to connect him to this particular class and this particular instructor that he already saw in his mind. Sure enough I found this class with this instructor. Pure Movement dance in Allen, tx had an all-boys hip hop class taught by Keith Green. His bio lists exactly what Jayden was looking for. I got Jay registered, funny that the class didn’t start until 6/27. I found this class 2 weeks before, just in time. Jayden started the class, loved it, was encouraged to try out for Pure Movement’s hip hop team Abstrakt Crew, made the team and will be performing throughout dallas over the next year. He’s made friends with other hip hop dance enthusiasts, and most importantly he is connecting to his purpose and passion. This is the power of visualization. Seeing yourself already where you want to be. The thing about visualization to see yourself as your authentic self doing and being. It is not about creating a persona that has nothing to do with your purpose. Try this for 2 weeks with a small goal. If you want to lose weight, shrink that goal down to something more specific like I want to eat more green vegatables and lean proteins and drink fresh spring water. Now picture yourself eating delicious green vegatabes, lean cuts of protein and drinking fresh icold spring water that quenches your thirst. See this picture every day for a couple of minutes. Before you know it you will start taking action on that thought. You will be eating delicious green vegatables, lean cuts of quality grade meats and drinking fresh cold water that quenches your thirst like nothing else. When you go to the store to buy food you will be drawn to by green verggies, lean cuts of protein and spring water. You won’t even think twice about it. As a result you will have lost a few pounds and improve your health. Making a declaration like I want to lose weight is very broad, so broad that it would be difficult to create a picture with specific actions resulting in weight loss. But if you create a specific goal, like I want to dance like Chris Brown, then visualize what that means to you and how you see that playing out in reality (dancing on stage, dancing in front of large crowds, etc) then it’s easier for the correct actions to follow that thought process…i.e sign up for hip hop classes. I want to start my own business. That is too broad. Ask yourself if I want to be an entrepreneur what do I want to share with the world? For this example, lets say you have a passion for travel, I know I do. we will say you want to help people see the world and make it affordable. How do you see yourself doing this task as it relates to being an entrepreneur? Are you creating an app? Are you getting certified as a travel agent and starting a franchise? Are you a travel blogger? Are you starting a tour guide company? Whatever it is you see; that’s the picture you want to remember and look at every day . As you visualize this picture every day you will soon take an action that will take you one step closer to reaching your goal of starting your own business. 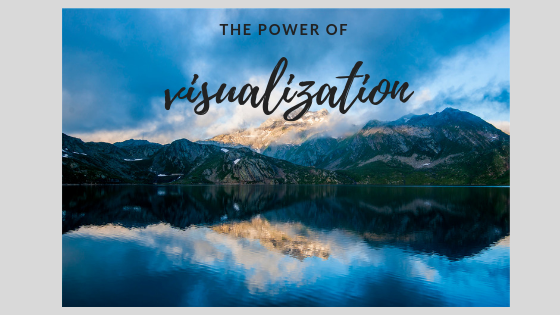 I hope this post was helpful in understanding why the power of visualization is truly powerful and understanding how it works. Create a picture of you accomplishing your goal. Write it down and take a mental picture of it. Every day remember this picture and focus on it. It is always good to write down your goal and be descriptive as possible including as many details as you can see. Go back to this writing often to refresh the image in your mind if necessary. Try this and you will see your actions follow your thoughts.